We have an awesome special offer right now. 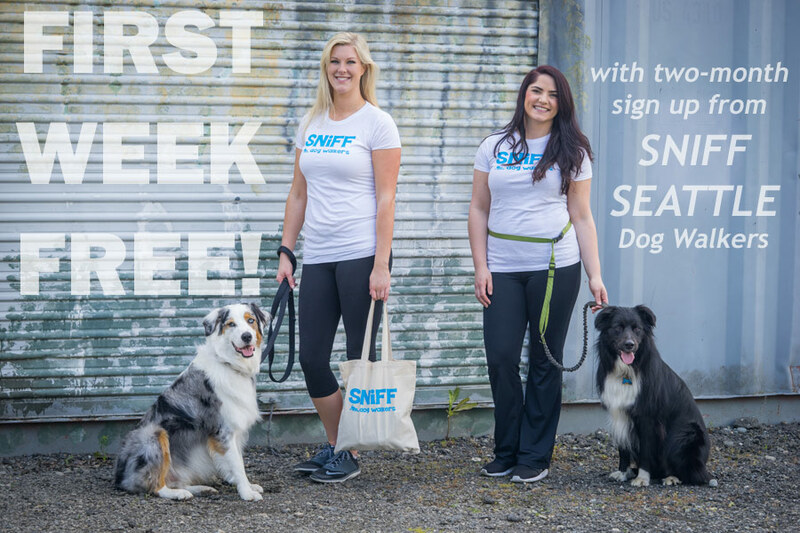 Get your first week of dog walking FREE when you sign up for two months of service with SNIFF Seattle Dog Walkers. Get a great walker — and save a few bones! Click here to learn more. Do you have two dogs? Only $5 more per walk! Do you have two dogs? Only $5 more per day! Additional charge for midday walk. No charge for a second dog or cat. This service is fully booked for Thanksgiving and Christmas Weeks. Additional Information Regular hours: 8:00 am to 6:00 pm, Monday through Friday. Sniff Seattle is closed for regular walking services on the following Federal holidays: New Year's Day, Memorial Day, Independence Day, Labor Day, Thanksgiving and Christmas Day. Walks or pet sitting services on those six holidays, if available by arrangement, are $10 additional. Walks or visits before 8:00 am, after 6:00 pm and on weekends are $5 additional. Convenient payment options: pay online with credit or debit card, or by check. 10% discount for seniors (age 62 and above) and active duty military. Senior, Military, Passport, Legacy and Puppy Our Relief discounts may not be combined. All services are subject to availability. Potty Breaks (10 minute visits) are not available in some areas and some situations. One dog maximum for Potty Break service. Potty Breaks and Puppy Out Relief are available to clients getting those services on a recurring, weekly basis only. By arrangement, we may be able to provide concierge-type services (or incorporate those services into your walk time), billed at our usual dog walking rates. Sniff Seattle is a client-based provider of scheduled services; services are available to clients only. An in-home visit with you and your pet is required in order to approve new service. Due to commitments to our recurring customers, we don't offer one time only or one day only dog walks. We're committed to providing exceptional service and will not accept a new client if we cannot fully guarantee the service they're signing up for. An approved entry plan is required for all services. If we need to check out a key from an office in order to get into your home, or need any assistance from your office to access your home, a $2.50 surcharge applies. Walks and visits that go overtime due to closed offices, missed call box calls, or similar entry-related scenarios will be billed for their actual time. All walks and visits are clocked using service time (building entry to exit). Initial meetings are always free; there may be a charge for additional meetings. We recommend clients provide a key at our initial meeting to avoid paying a small key pick up fee. For pet sitting services only, a non-refundable deposit (25% of total cost) is required at time of reservation. Medication is always administered free of charge. We don't breed discriminate. See our Service Area Map for primary service area. Or, see our Service Area List of neighborhoods, towns and cities we serve.